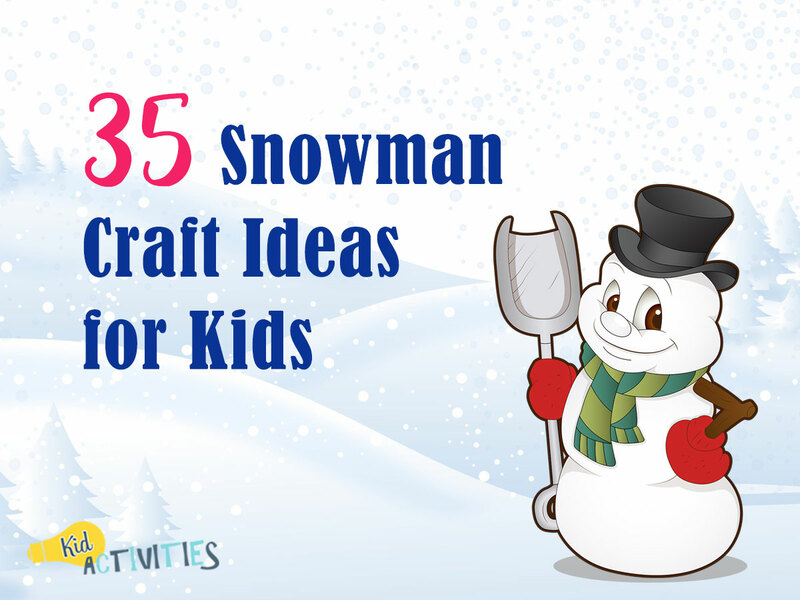 Enjoy these fun snowman craft ideas with your preschool class. These simple arts and craft ideas are sure to provide hours of entertainment. Glue the two plates together to make a basic snowman. Use the round stickers (or google eyes) for the eyes, mouth. Add buttons or decorate as above with pipe cleaner. From scraps of card stock– cut two twig arms (or use pipe cleaners as image shows), mittens, a carrot nose and a scarf. Glue these to your snowman. Add a hat and he’s done! Some packing peanuts are great for building because they have a cornstarch base. Have children build a snowman by moistening the peanuts and sticking them together. Add eyes, nose, etc. for character out of whatever bits you have around! I’ve read how one program puts them outside on the playground when it rains. It may take a few days, but it will dissolve! Also, use the peanuts to build igloos and other projects. 4. SOCK SNOWMAN Stuff clean white socks with dried beans, peas, coffee beans, or small rocks rubber banding off sections as you fill them. Finish the tops by rubber banding it shut. Glue with hot glue; glue on the toe of a colored sock for a hat, turning up the edge. Decorations such as buttons, orange pipecleaners, felt/faabric pieces, black pom-poms, glue-gun, etc. 1. Shave the bottom off the largest ball with a knife so it will stand. 2. Using a gluegun, attach the middle sized ball and then the smallest ball for the head. 6. SOAPY SNOWMAN Using a grater, grate soap such as Ivory. Add a couple tablespoons of water and mix into a ball using hands. Take the soap out of the bowl and separate it into three sections- one small, one medium, and one large. Roll each section into a ball and stack the balls to form a snowman. If necessary, rub a little water on the soap where you are joining the pieces. This will help it stick. Add eyes and a nose using spices. You can use toothpicks for the arms and fabric for a scarf. Let harden. Isn’t this Cute! For young children but cute anyway! Sample Photo Courtesy of Cere Child Care and Pre-School. Place child’s hand in white paint make a handprint on colored paper. When dry–add top hats, facial features and buttons down the snowmens’ chests! Preparation: Cut various-sized circles out of sponges. Choose a large, medium, and small sponge. Dip the large sponge into thinned white paint. Do not get too much paint on sponge! Stamp largest shaped on bottom of page. Stamp medium circle above it, and small above that…., to create snowman shape. Paint features and other accents on with a paintbrush. Cut three circles from clear contact paper. The circles should be in three different sizes ranging from a diameter of 1 1/2 – 2 inches to 4 1/2 – 5 inches. Staple the contact paper, backing side up, to the construction paper to form a snowman shape. Peel off the backing and stick cotton balls to the contact paper to cover the snowman. If you like, cut additional snowman features such as a hat or carrot from construction paper and glue to the snowman. Give children three balloons –one big, one medium, and one small. Roll the balloons in white paint and then place them on a piece of paper to make a snowman. They can add features, scarf and a top hat with paint. A cute touch is to add froot loop cereal for the buttons! Be sure to have extra to munch! 1. Ball up newspaper and stuff it into one of the lunch bags. 2. When a bag is full, take an empty bag and pull it over the stuffed bag. 3. Cut pieces of yarn and wrap them tightly around the middle of the bags (or below where the head would be) to form the top and the bottom sections of the snowmen. Salt dough is fun to make as well as to model with. This salt dough snowman makes a nice Christmas present or tree decoration. Left-over dough can be kept in the refrigerator for about five days. Mix the flour and the salt in the bowl. Gradually add the water until you have a firm, pliable dough. Set aside for ten minutes. Place the dough on the pastry board and roll a 4 cm (1½ in) wide ball for the body and a 3 cm (1¼ in) wide ball for the head. Flatten the body and head. Lay the body and head on baking parchment, butting them together. With the rolling pin— roll a scrap of dough to ¼ inch (5 mm) in thickness. Cut a rectangle about 1½ x 1¼ inches (4 x 3 cm) for the hat. Press to the head. Roll four logs 1 cm (½ in) thick. Lay one across the hat as a brim. Lay another across the ‘neck’ as a scarf. Lay the other logs at angles to the scarf, touching at the top, and dent the ends for a fringe with the knife. Roll three small balls of dough; press one to the head as a nose, the others to the body as buttons. Make a hole at the top of the hat with the straw. Place the snowman on baking parchment on a baking sheet. Place in a preheated oven 250 degrees Fahrenheit, for about 6 hours, until hard. Leave to cool in the oven. Paint the snowman’s body white. Paint the hat, scarf, nose and buttons. Add a smile and two eyes. Leave to dry then thread the ribbon through the hole and tie. 5 small rocks (about 1/4 inch diameter) or buttons. Snow-plow cinders are the perfect size. Hot glue and hot glue gun or white glue. Paint six craft sticks white. Paint one of the craft sticks entirely black. Make two vertical cuts about 1in long in the top of the center of the cardboard. Fold slightly to make a flap as illustrated. Punch a hole in the center of the top of the flap of cardboard (to hang from a nail). Glue the six white craft sticks to the cardboard scrap as shown. Glue the black craft stick down to create the brim of the hat, as shown. Glue the wiggle eyes on to the snowman’s face. Wrap the ribbon around the brim of the hat and glue the ends in place on the back. Glue each of the small stones or buttons to the snowman’s face in the shape of a smile. Spread glue all over the toilet paper roll with a paint brush. Next cover the entire roll with cotton balls. Add black eyes nose and a mouth. Cut a desired shape hat in any color. 3. Make a hat using an old baby sock! (Another good thing to add to your items on ‘Family and Friends’ Wish List!) Cut the sock and use the ‘toe’ part. 4. You can make a scarf by braiding several strands of yarn–or by cutting a piece of felt or material. It doesn’t have to snow to make a snowman! Cover your table with plastic, and then spray several cans of non-menthol shaving cream on top. 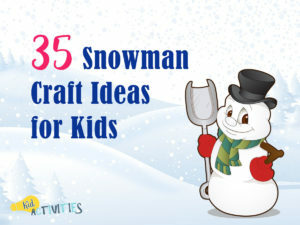 Kids have fun making snowmen–pretending it’s snow! You may want to have them wear shirts or aprons over their clothing; cleanup is simple! Make Puff Paint by mixing equal parts of glue and non-menthol shaving cream. Cut out 3 circles: one small, one medium, and one large. Glue them onto blue construction paper. Decorate the snowman and scene with collage materials. When complete, have children paint onto the snowman. User popsicle sticks, q-tips, plastic spoons, fingers, etc. to paint. When dry, hang for puffy snowman decorations! This more simple snowman on the right– also was made with a mixture of equal parts of white glue and non-mentol shaving cream You just may find that when doing projects such as this— kids will turn it into a complete sensory event! It has never failed that my 3 to 6 year olds (and many older) — love the entire tactile experience. They’ll start out with the project at hand and then….well…check out the image! 1. Take 3 pom-poms and glue across Popsicle stick. 2. Take red sock or felt and cut a 1/2-inch x 8-inch strip. Tie the “scarf” around the snowman’s neck. 3. Glue on wiggle eyes. 4. Cut “buttons” out of edge of black felt and glue on as snowman’s eyes. 5. Depending on the type of nose you want for your snowman, cut out orange felt, or construction paper—or a piece of clay in a carrot shape. 6. Cut a rectangle out of black felt 3 x 4 inches long and glue the short ends together to make the hat. 7.Trace around the top of the hat to make a circle to fit. Cut out and glue on one end of the hat. 8. Trace around the bottom of the hat, making the circle slightly larger to make the brim. Cut out. 9. Stuff the hat lightly with felt scraps to help it keep the shape. 10. Glue the brim to the bottom of the hat. Glue the hat onto the snowman’s head and anchor onto the Popsicle stick. 11. Glue a magnet strip to the back of the Popsicle stick and let dry. 21. OPEN ART TABLE~ Put out the white and black paint, blue, black ,white, and orange construction paper, art paper, a bit of ribbon and/ or material and see what the kids come up with! This sample image is courtesy of Shannon Stewart, Art Teacher atStetson Hills School in Phoenix. The work is that of a third grade student. 1. Using a clean new stirring stick, paint the majority of the stick white, leaving some space at the top to paint black for the hat. 2. Paint the top of the stick and small strip of wood black. When all the paint has completely dried, glue the black strip of wood to the hat. 3. Use the Tempera paint to make the face and buttons. 4. Tie the material around the narrowest part of the stick, which is the neck of the snowman. OPTIONAL: Glue some decorative greenery, holly, or bell to the hat. Glue the yarn to the back of the hat forming a hanging loop. Print a picture of a snowman for each child. Dip popcorn in corn syrup and stick it to the snowman silhouette. Let dry. Use fishing wire, string, or yarn to hang. Cut circle shapes from bubble wrap. Press the wrap into the white paint—next press the painted wrap on the paper. Press the circles 2 or 3 on top of each other to look like a snowman. The snowman will look like it is made from snowballs. Decorate the dried snowman as desired. Use packing bubbles to make a snowman. Paint the bumpy side with white tempera and press onto dark paper. For this Snowman scene…KidActivities mixed equal parts of liquid tempera paint with liquid dishwashing soap. The mixture is a little watery…so be sure to cover floors and have paper toweling nearby. The drips of paint wipe up easily. The ‘snowman’ was made with a circular motion of the brush. The other parts (hat, stick arms, scarf, facial features) of the scene were used with a stippling effect of the brush. As above…be sure each color dries before you paint over the first. Good News! My ‘Snowman Friend’ easily washed off the door–just using a wet cloth! Cut the appropriate nose and hat shapes out of your scraps. Using tiny dabs of white glue, attach the features carefully. Use a marker pen to draw a mouth. Place glue on a piece of paper in the shape of a snowman. Have the children add coconut to the paper. Simply put a glob of hot glue onto a sheet of wax paper. While glue is still warm-place eyes, nose and mouth. 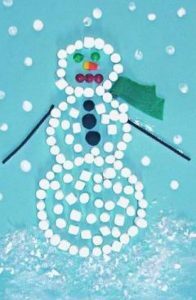 When melted snowman is firm, peel it off of wax paper and glue on pin backing. Slide a carrot shaped nose–button or pom-pom eyes–and button or pom-pom buttons down the inside of the jar. Add small twigs from outdoors– or pipe cleaners for the arms. 1. Fill a peanut butter jar with cotton and replace the lid. 3. Complete decorations by adding facial features, buttons, and an orange pipe cleaner nose. 4. To make the hat, first glue construction paper around the edge of the lid. Draw three circles on heavy construction paper or card stock. Make the face as desired. For eyes, ‘KidActivities’ used google eyes on one… and M&M’s on the other. To continue, outline the circle shapes with marshmallows. Add Popsicle sticks, Pretzel sticks, twigs or pipe cleaners for arms–and a bit of ribbon or cloth for a scarf! As illustrated–snowman can be filled in with marshmallows as well as finger print snow flakes and artificial snow or shredded coconut added as desired. Put out a variety of supplie and see what the kids come up with! IT”S “SNOW” SECRET…SAC (or grade ____) IS “COOL”! Hang shiny blue wrapping paper on the board or door and put the snowman in the middle. Then have each child cut out a snowball and sign it. Scatter all the snowballs around the door or board. It should look like it was the target of a major snowball fight! It’s something you can leave up from first snow to last snow! One is juggling snowballs; the middle is about to throw a ball; the last is ‘mid-flip’ while jumping rope! HAVE FUN WITH OTHER SNOWMAN AND WINTER PAGES!